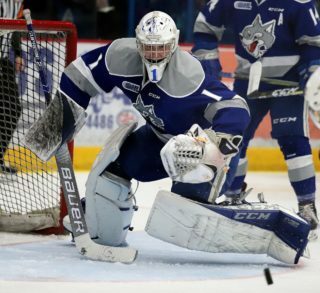 The Mississauga Steelheads were the hungrier team Friday night as they held on to take a 5-4 victory over the Sudbury Wolves who were playing their second game in as many nights. The Steelheads got on the board first as they scored 13 seconds into the opening period with the goal coming off the stick of Albert Michnac. 7 minutes later Cole Schwindt extended their lead to 2-0. Two quick power play goals from Dmitry Sokolov and Blake Murray got the Wolves back into the game. With 1:30 left in the first period, Trent Fox scored for the Steelheads to give them a 3-2 lead heading into the intermission. The next two periods had both teams exchanging one goal apiece, which not quite enough for the Wolves to overcome the Steelheads. Ryan McLeod capitalized on a power play five minutes into the second period to extend the Steelheads lead to 4-2. After a great play between Dawson Baker and Zack Malik, Baker scored his first of the regular season after beating Emanuel Vella with a one-timer to cut the deficit to 4-3 after forty minutes. In the third period, Michnac and Cole Candella responded to one another to swap goals once again. Michnac’s goal came on a 5 on 3 power play and marked his second of the game, while Candella’s tally was his first of the season and first in a Sudbury Wolves uniform. Despite lots of pressure from the Wolves at the end of the period trying to tie the game, they could not get anything past Vella. The Wolves outshot the Steelheads 29-27. The Wolves will now travel back to Sudbury to enjoy the Thanksgiving weekend before returning to action next Friday evening against the Ottawa 67’s at 7:05 pm. Friday’s game is sponsored by KICX 91.7. Fans are can purchase their tickets to the big game online or at the Sudbury Arena Box Office.